Heat oven to 350°F. Line large cookie sheet with cooking parchment paper. In small bowl, mix 1/2 cup of the Nutella™, the cream cheese and whipping cream; stir until smooth. 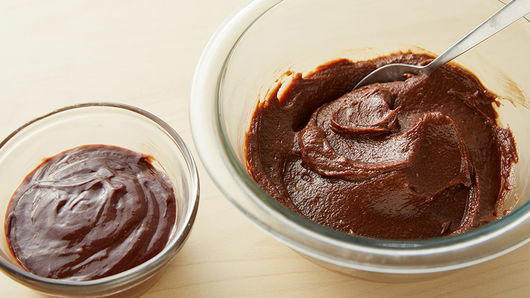 In another small bowl, mix remaining 1/4 cup Nutella™ and the jam; stir until smooth. On parchment-lined cookie sheet sprinkled lightly with flour, unroll first can of crescent dough. Press or roll dough into 12x11-inch rectangle. Place 10-inch round dinner plate or cardboard circle on top of dough rectangle. Using a pizza cutter or sharp knife, cut away excess dough, and reserve for another use. Carefully spread half of the Nutella™ cream cheese mixture on top of the dough circle. Lightly sprinkle work surface with flour, and unroll second can of crescent dough. 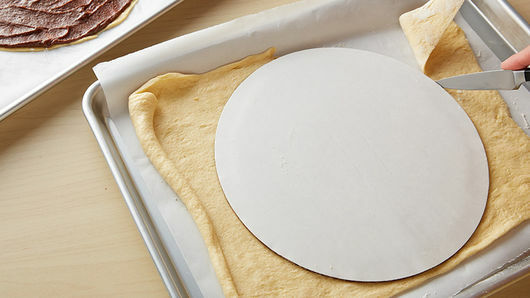 Repeat steps to cut out another 10-inch circle, and quickly transfer on top of Nutella™ cream cheese layer. 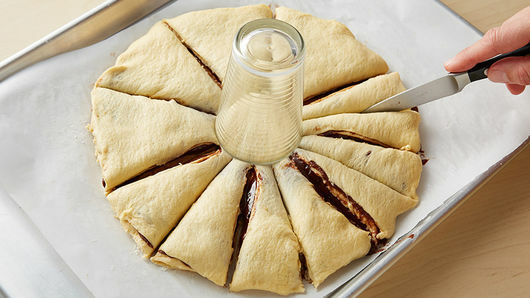 Carefully spread Nutella™ jam mixture on top of the second dough circle. Lightly flour work surface, and unroll third can of crescent dough. 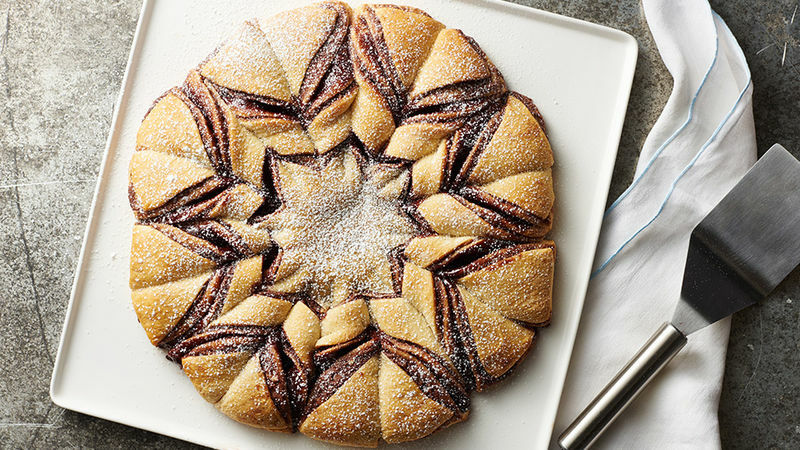 Repeat steps to cut out another 10-inch circle, and quickly transfer on top of Nutella™ jam layer. 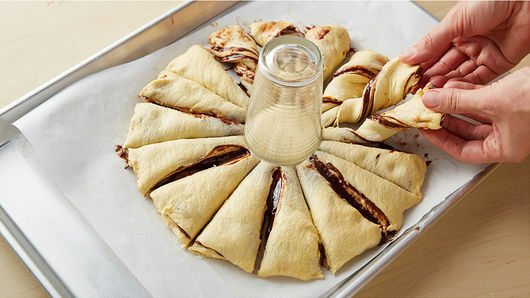 Carefully spread remaining Nutella™ cream cheese mixture on top of third dough circle. Lightly flour work surface, and unroll fourth can of crescent dough. 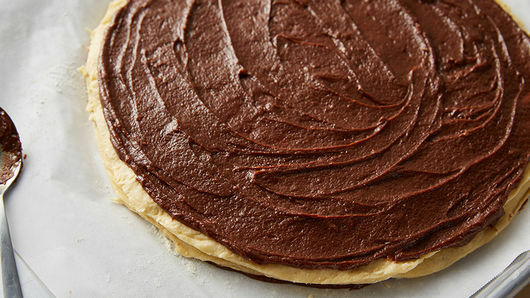 Repeat steps to cut out another 10-inch circle, and quickly transfer on top of Nutella™ cream cheese layer. Place a glass or small jar with 2 1/2- to 3-inch opening in center of dough circle stack. Leaving center intact, use sharp knife to cut layered dough into quarters (12 o’clock, 3 o’clock, 6 o’clock and 9 o’clock). Divide each quarter into 4 equal parts, creating 16 total sections. Remove glass from center of dough. To twist, take two sections of dough (side-by-side), and slightly pull and twist each section in the opposite direction of each other. Repeat for all 16 sections of dough. Bake 27 to 30 minutes or until deep golden brown and baked through. Cool 5 minutes; sprinkle with powdered sugar. Serve warm. 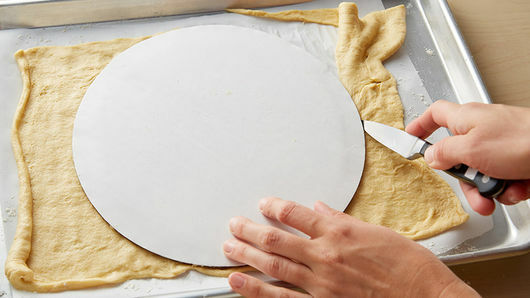 We found the easiest way to transfer each dough circle is to cut each circle on a sheet of parchment paper and then use that parchment paper to carefully flip it over onto the stack. Need an idea for using the leftover crescent dough? Try this delicious Sausage Crescent Cheese Balls recipe. Sliced almonds add nice texture and crunch. If desired, sprinkle on top of dough before baking. Experiment with different jam flavors. Instead of raspberry, try strawberry or blackberry.